Overview - Alex Proyas, (The Crow) directs this futuristic thriller about a man waking up to find he is wanted for brutal murders he doesn't remember. Haunted by mysterious beings who stop time and alter reality, he seeks to unravel the riddle of his identity. Even though the Wachowski Brothers have continually acknowledged the various films that influenced their sci-fi masterpiece, ‘The Matrix,’ audiences and critics give the film a bit more credit than it deserves. A year before ‘The Matrix’ descended on theaters, director Alex Proyas’ dystopian noir, ‘Dark City,’ offered genre fans a nightmarish vision of an imprisoned populace, a deceptive group of reality-altering captors, and a hero who develops the power and understanding to break through the illusion of his world and fight to free his people. 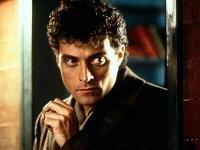 When a disoriented amnesiac (Rufus Sewell) wakes up in a disheveled hotel room, the only clues he has to his identity are a suitcase, a goldfish, a broken syringe, and a murdered prostitute. As he struggles to remember his name and the demise of his guest, he gets a phone call warning him that a group of dangerous men are coming for him. 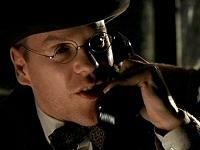 After escaping the building and a trio of menacing humanoid creatures, the man deduces his name is John Murdoch, discovers he has an adulterous wife named Emma (Jennifer Connelly), and learns he had been visiting an eccentric doctor named Daniel Schreber (Keifer Sutherland) before he lost his memory. As he begins to uncover the truth of his existence, the identity of the eerie strangers, and the purpose of the city itself, Murdoch must face the possibility that everything he’s ever known is a lie. With the reluctant help of a homicide detective named Frank Bumstead (William Hurt), Murdoch works to prove he isn’t a killer and that the world isn’t what it seems. Like ‘The Matrix,’ ‘Dark City’ owes its existence to numerous noir and sci-fi classics that proceeded it (‘Metropolis,’ ‘M,’ and ‘Blade Runner,’ to name a few). Proyas’ cityscape was even inspired by his own work on ‘The Crow,’ as well as a hodgepodge of other genre influences that allowed him to set his story in a vague time period that combines elements of every decade in the twentieth century. However, to Proyas’ credit, ‘Dark City’ transcends its sources to fashion a compelling vision that feels more substantial than its patchwork production might suggest. His script is tight and twisted, his characters are subconsciously unsettled by the disparities of their reality, and his cast deftly elevates their performances from simple genre homage to something more significant and momentous. Despite avoiding long-winded dissections of pop philosophy or providing viewers with a detailed origin of the Strangers, Proyas blends his plot and characters together into a fairly complex study of belief, perception, and identity. 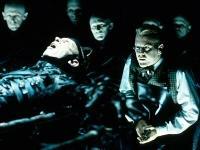 Even so, the original theatrical version of ‘Dark City’ was hampered by some studio tampering. After being told that audiences wouldn’t have the patience required to dig through a dense mystery, Proyas was forced to trim down some extraneous subplots and add narration that would reveal the nature of the Strangers and the city at the beginning of the film. The new 111-minute Director’s Cut (being released concurrently on Blu-ray and DVD) finally eliminates the narration and gives Proyas the opportunity to present the film as he intended. For the most part, the new changes improve the experience. The visual representation of Murdoch’s abilities are more subtle, Connelly’s actual vocals are used when her character sings, enhanced special effects add more detail to the city, and the appearance of a young girl allows Bumstead to transition from skeptic to believer more naturally than before. Alas, a few things aren’t so successful. The spiral pattern makes a new, nonsensical appearance, a few additional interactions between minor characters are quite arbitrary, and the film’s pacing isn’t as intense as it was before. Even so, I have to say I prefer the Director’s Cut and will probably revisit it more often than not. Regardless of which cut you settle on, ‘Dark City’ is an absorbing mix of classic noir and science fiction helped along by a sharp script and gripping story. Granted, anyone who doesn’t dig the throwback performances and dialogue will have a difficult time sinking into Murdoch's journey, but those who enjoy Proyas’ multi-genre hybrid will find themselves lost in the director’s imagination. After clinging to a cluttered, murky DVD for the last eight years, I was beginning to wonder if I’d ever get to see what lurked in the darkest corners of ‘Dark City.’ Thankfully, New Line has produced an attractive 1080p/VC-1 transfer that renders the standard DVD obsolete with vibrant colors, bold primaries, and deep blacks. Moreover, contrast is just as I remember it in theaters, delineation is revealing, and the picture boasts convincing depth and dimensionality. Even the Strangers’ shadowy underworld doesn’t miss a step -- despite the fact that the creatures wear black leather in the shadows of a dimly lit arena, source noise and crushing are never a problem. In fact, light or dark, each scene displays a remarkable boost in image clarity and fine detailing. Granted, the film’s textures aren’t as refined as they could be (more on that in a moment), but the blurry objects and smudged on-screen text that populated the DVD are now sharp and distinguishable. Pay attention to the diner interior when John retrieves his wallet, the starfield waiting for Murdoch and Bumstead at Shell Beach, and the crisp chaos in Walenski’s wall art. This new high-def picture doesn’t just offer an upgrade, it gives fans an excuse to revisit familiar scenes and discover new details they missed before. Nothing outright spoils the experience, but purists will probably be bothered by the studio’s post-processing exuberance. While New Line’s tinkering isn’t nearly as detrimental as message board doomsayers are suggesting, discerning viewers will still catch several instances of edge enhancement and notice a slight application of DNR (similar to New Line’s ‘Pan’s Labyrinth’ transfer). Skin textures are rendered a bit waxy from time to time, but are never flat or lifeless enough to cause any serious concern. Likewise, thin halos appear in high-contrast shots, but are negligible enough to escape all but the most astute videophiles. Don’t get me wrong, I wish New Line and Warner had produced a more faithful and filmic transfer, but there aren’t any other technical issues to warrant a further reduction in the score. Would this be a 5-star transfer if it didn’t have EE and DNR? You betcha. Do I think people should forego experiencing Proyas’ trippy noir in high definition because of two relatively minor issues? Not a chance. I’ve been nuzzling up to my ‘Dark City’ DVD for years now (warts and all) and this disc is the first thing that’s given me a good reason to move on. Its new Blu-ray transfer may not be perfect, but it does deliver a crisp and vibrant rendering of the film that should please fans and newcomers alike. New Line sweetens the deal with a commanding DTS HD Master Audio 7.1 surround track that comes close to creating a convincing theatrical experience. First and foremost, fans will notice LFE-support and rear speaker aggression has been increased exponentially from the ancient DVD mix. Low-end bass pulses give the tuning scenes weight, the Stranger attacks exhibit palpable presence, and the soundfield assaults the viewer from all angles. I’m also pleased to report that the shifting city buildings no longer sound like a muddled freight train, but instead feature the sort of subtle attention to detail one might expect from modern sound design -- brick scrapes across stone, the pavement crackles, and expanding walls creak and moan. On the technical front, directionality is far more precise, pans are clean and swift, and ambiance is more immersive and involving. My lone nitpick is that dialogue still gets lost under the chaos at times. While this may be an intentional design decision, Bumstead and Murdoch’s arrival at Shell Beach, the climactic showdown with Mr. Hand, and John’s seaside chat with Emma don’t sound as perfectly prioritized as I had hoped. Still, ‘Dark City’ packs more power, hits harder, and is more immersive than I expected it to be. The Blu-ray edition of ‘Dark City’ includes all of the special features that appear on the new DC DVD, all of the significant supplemental material from the original DVD, and even an exclusive fact track (detailed in the next section). The only downside is that the video content is presented in standard definition. Director’s Cut Expanded Commentaries -- The big draw here is a triple-threat commentary bundle of audio commentaries attached to the Director’s Cut of the film. Alex Proyas finally gets a solo track, writers Lem Dobbs and David S. Goyer have a session all to themselves, and critic Roger Ebert discusses his impressions of this new cut of his favorite film of 1998 (this recording was completed more recently than his original DVD commentary, but presumably before July of 2006 when complications from a medical treatment left him unable to speak). Oddly, each track drags a bit and the filmmakers rarely sound as excited about their work as Ebert does. Still, they provide thoughtful and informative analysis, a thorough explanation of the differences between the film’s cuts, and a slew of decent anecdotes about the cast and crew. The only disappointment here is that the writers’ commentary isn’t actually a new track -- instead, the disc’s producers isolated and reused the recording Dobbs and Goyer contributed to the DVD’s original filmmakers’ commentary. A small complaint to be sure, particularly since this version of their comments includes an expanded and more thorough overview of their thoughts. Filmmakers’ Commentary -- After accessing the theatrical cut of ‘Dark City,’ viewers can listen to Proyas, Dobbs and Goyer, DoP Dariusz Wolski, and production designer Patrick Tatopoulos discuss the production at length. The track is a bit disjointed since the participants didn’t record their sessions at the same time, but it still covers a lot of ground without growing repetitive or losing focus. While this particular audio track originally appeared on the previously-released DVD, uber fans will probably get a kick out of listening to the filmmakers’ original reflections on the film. Guest Critic Commentary -- Ebert recorded this commentary when the film was first released on DVD. Honestly, this is the best of the bunch simply because he sounds so enthused by the material. He offers a fascinating categorization of the film, discusses its influences, and explains why the film captivated him as much as it did. This particular commentary may not hit on the director’s cut, but it provides the most engaging track of the bunch. Introduction by Alex Proyas and Roger Ebert (SD, 5 minutes) -- Proyas and Ebert deliver separate introductions that provide quick overviews of their thoughts on ‘Dark City.’ Neither man reveals any information or ideas that can’t be found elsewhere in the supplemental package, but the intros allow both to reflect on the benefits of a director’s cut. Memories of Shell Beach (SD, 43 minutes) -- This thorough exploration of the film’s production digs through the genesis of the story, Proyas’ intentions, the screenplay, and the shoot itself. It tosses dozens of interviews on the screen and adds behind-the-scenes footage, concept art, and other surprises for good measure. While it’s a bit dry considering the subject and genre of the film, it still works as a solid companion to the film. Architecture of Dreams (SD, 34 minutes) -- A second documentary hones in on the set design, costuming, and special effects of ‘Dark City.’ There isn’t anything revelatory to be found here, but it is impressive to see how much work and detailing went into the production. Text Features -- The disc also includes a ridiculously short review of ‘Dark City’ from author and comics legend Neil Gaiman, an essay comparing ‘Dark City’ and Fritz Lang’s ‘Metropolis,’ an original 1927 review of ‘Metropolis’ by famed author H.G. Wells, and a second review of ‘Metropolis’ from Weekly Variety. Production Gallery -- A collection of 80 photos and images. ’Dark City’ has developed a rabid fanbase over the years that praises its bleak vision and intricate story. As it stands, the new Director’s Cut and subsequent Blu-ray edition of the film will only help strengthen that following. 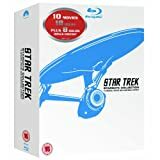 The disc offers fans a sizeable improvement over the DVD with an excellent video transfer (whose only hiccup is DNR and EE), a powerful DTS HD MA 7.1 surround track, and a vast collection of supplements that includes five audio commentaries. Admittedly, this release isn’t perfect, but the criticism it’s receiving on message boards across the net is exaggerated and overblown. Check it out for yourself and enjoy the upgrade.